The eastern part of Tibet at 1:1,600,000 on a double-sided map from Swiss publishers Gecko Maps, with excellent presentation of the topography and plenty of names of local villages, places of interest and facilities including tourist accommodation, villages interesting markets or food shops, etc. 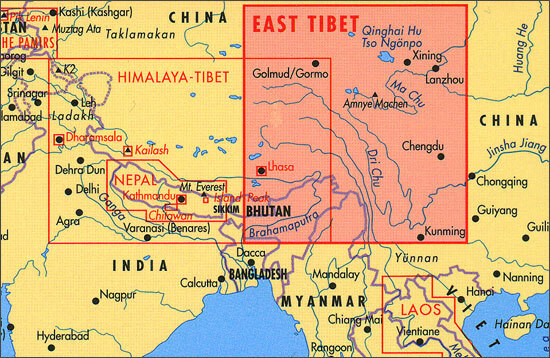 The map divides the region north/south, extending on the southern side from west of Lhasa and most of Bhutan to beyond Chengdu and Kunming; the reverse side extends coverage northwards well beyond Lanzhou to the latitude of 40º. All place names are in the Latin alphabet, showing where useful both the Tibetan and the Chinese name; names of larger locations and selected tourist destinations are also given in the Tibetan alphabet. Topography is presented by relief shading and plenty of spot heights, plus altitude colouring which also indicates the influence of the monsoon (as in the publishers’ companion map “Himalaya – Tibet”). The region's dense network of rivers and lakes is shown with swamps, salt swamps and lakes, and seasonal rivers. Road network includes secondary roads and tracks, and shows driving distances on main routes and locations of border crossings. 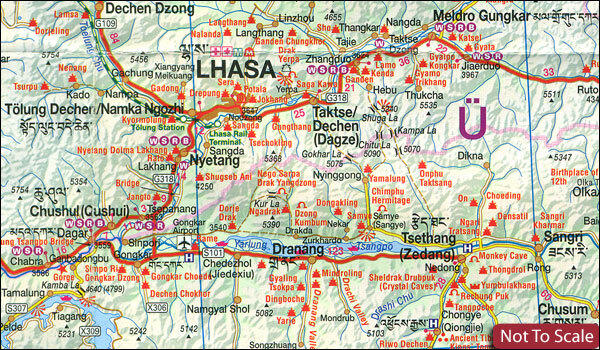 Railway lines include the Golmud - Lhasa route and the map also indicates local airports/airfields and helicopter landing sites. Symbols highlight various places of interest, including religious sites, and selected locations with tourist accommodation, shops or medical facilities. The map also shows provincial and county administrative boundaries and names. Latitude and longitude lines are drawn at 1º intervals. Map legend includes English.